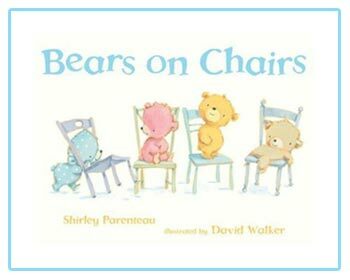 Earlier this summer I ordered a book that has quickly become a storytime favorite for sharing with both preschoolers and toddlers. 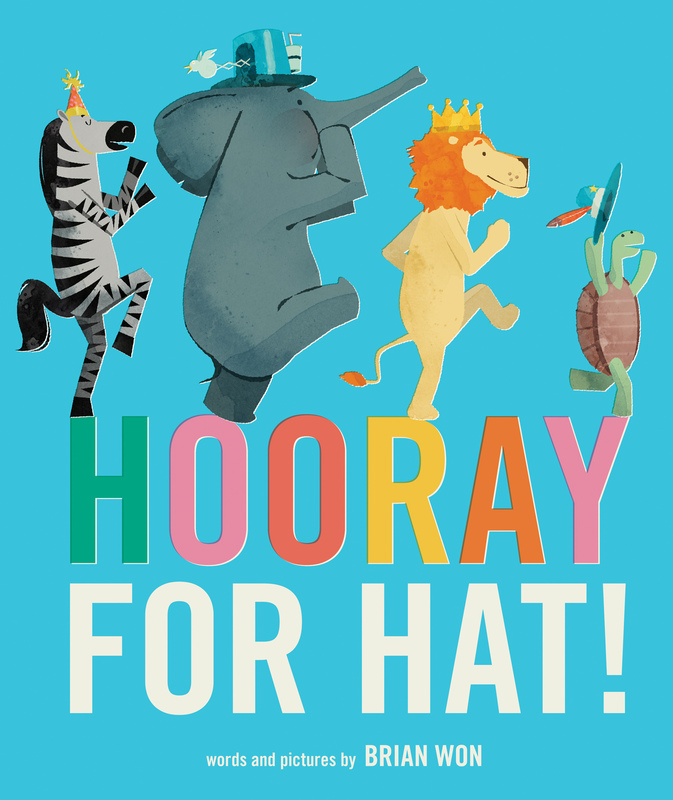 Hooray for Hat (Houghton Mifflin Harcourt, 2014) author/illustrator Brian Won offers a book experience that is successful in many ways. The story is fun and heart-warming. I liked this book so much that I decided to add it to the collection of 10 Ways to Explore a Book posters I’ve been making for families. The other posters I’ve made can be found on our community’s early literacy site here. 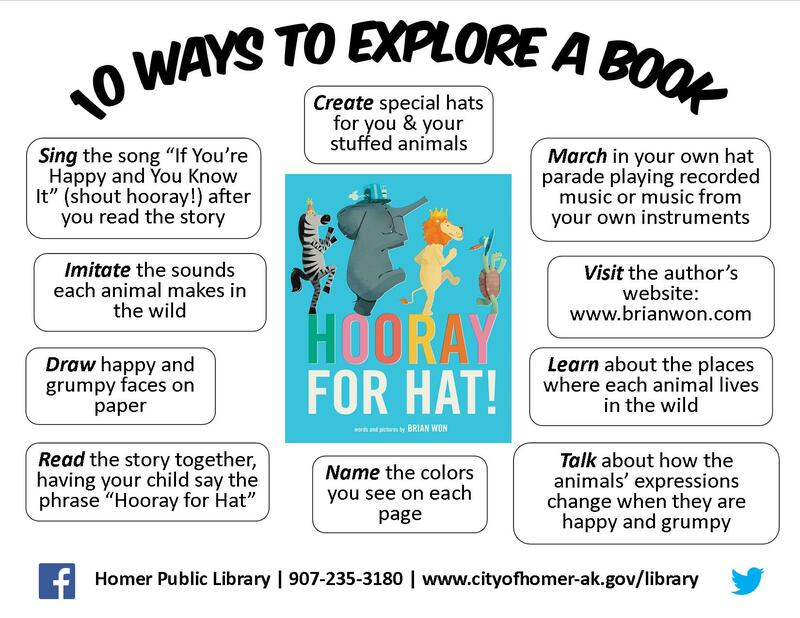 Check out Brian’s site for other activity ideas that may be a great fit for your library or for sharing with families to do at home. Then tuck them into bed. I always get lots of help with this one! If you’re ready for a story, rub your belly! As we read the story, we looked for the spiders and alligators from the two previous songs. Reach down low. Reach up High. Play: Stacking toys like the Fisher Price Rock-a-Stack or the Kidoozie Nest and Stack Bucket which are very popular with these storytime kids right now. I have introduced and successfully integrated apps into several of my library’s weekly preschool storytimes. However there are some apps and digital media I have not used, but wished I could. Our storytimes are held in our children’s library instead of a separate storytime space and the beautiful design does not easily accommodate media tools like large screens. When the space was designed and built, new media was not part of the storytime conversation. Without a large screen on which to project book apps and other new media, some are too difficult to use or be seen by large groups on the smaller iPad screen. In fact, ability to be easily seen on the iPad screen and used by groups are two of the criteria I use for selecting apps for storytime. Innovation, as always, requires creativity! So, with my director’s support and interest, I designed a new, digital storytime using our meeting room with its large monitor and space for comfortable seating. (We removed the meeting tables before the event and brought in the beanbags from the children’s library.) We decided to not only alter the media format for the pilot program, but to also host it on a Saturday, another first for our library. The digital storytime seemed like a perfect fit for Little eLit’s October Tech Challenge, in which we try something new and a even little bit nerve-wracking in honor of the “scary” month. Here are the details of my challenge-to-me program. 16 kids and caregivers attended the program. Kids were ages 2-9. Two teachers brought their kids. Only three of the kids had ever been to a storytime at the library (or outreach program) before this one. The group size was perfect for a pilot program in our room size and with the devices we had on-hand. I divided the one hour program into two parts. The first half was a storytime similar in format to the weekly preschool programs. We sang, moved, and read together. This format was used with the idea of offering some familiarity to families while at the same time letting me highlight apps that demonstrate the tips I planned to share with parents. The kids had fun while the parents saw the apps in action. The second half of storytime was dedicated to letting kids and caregivers try out apps I had preloaded on four iPads and share information with each other about apps they like. I also took the opportunity to talk with families about what to look for when searching for apps. Parent Tip: I explained the difference between a book app and an e-book. This app is so silly that even the adults were laughing! It quickly helped the group relax and caught their attention. The value of meaningful Interactivity: In this app the reader taps animals and objects to animate them. The actions closely relate to the story, as do the sounds which extend the story. Early readers can tap on the individual words to hear them read aloud even with the read-to-me function turned off. Choosing book apps: This is an engaging story with entertaining characters, not just just lots of interactivity plus it has simple, uncluttered pages with quality images and easy to read text. After seeing all of the silly, farm animals in Boynton’s app, we played a game identifying farm animals in this one. When the app is started, a barn appears and an animal’s sound is heard. Tapping on the barn opens the doors to reveal the animal making the sound. The name of the animal also appears on the screen. The barn doors then close and a new animal sound is heard. While this app works well with groups because there are multiple opportunities for kids to participate, I actually prefer another farm animal app, Animal Sounds-Fun Toddler Game, qwhich I have used in a weekly storytime about farm animals. The game format I use with it would not work with the apps projected on a large screen. Joint Engagement: A child could navigate this app on his/her own, but it is more fun when children and caregivers or children and other children play it together. Joint Engagement offers great opportunities for learning! Choosing apps: Look for apps that are age appropriate and can be played over again. Be sure to review an app before introducing it to your young child. Frog is a frog who has dreams. He wants to fly, even if it isn’t a frog thing. In this gentle story, again with meaningful interactivity, frog saves the day, realizes a dream and inspires his family and friends. I picked this book app because it demonstrates another way book apps can still be effective and engaging without being silly. Early literacy value: This book offers new vocabulary like the word aerodynamic and opportunities to build narrative skills. This is also a good choice for STEAM storytimes focusing on frogs. Choosing apps: Look for uncluttered, pages with easy to read text. I pointed out the read to me, read to myself, and auto play options and the button to turn music on or off, all features which I look for. We used this digital feltboard to act out the song, Five Green and Speckled Frogs (demonstrated here by the Jbrary librarians). Many librarians have talked about using this app and this felt story before. Instead of using screenshots of each movement in the story and projecting them with keynote, I saved my story (a new update) and physically moved the frogs as the story progresses in the song. This worked perfectly and mimicked one of the great aspects of traditional felt boards. I was comfortable doing the actions with my hands and moving the frogs on the iPad. Almost everyone sang along with this song. With multiple backgrounds and a zillion characters and features to choose from, this toy is perfect for kids of multiple ages and for playing together. Choosing apps: Select apps that encourage open-ended play and creativity. Early literacy value: This app is great for building narrative skills. This app is based on the popular book, Don’t Let the Pigeon Drive the Bus. The app does not include the book, but it extends the story by offering kids a chance to create and play using the beloved characters from the book. As a group we recorded a story directed by the bus driver. We were asked a series of questions and took turns saying silly answers which were then incorporated into a story that was played back and acted out by the bus driver and the pigeon. This was a great transition into the second portion of the program. 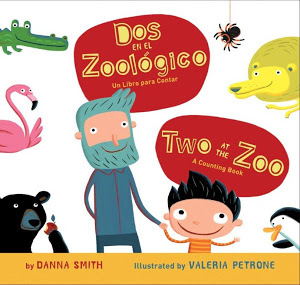 Early literacy value: Strengthens narrative skills and helps build vocabulary. This also provides a nice introduction to creating digital stories. Choosing apps: This app has no in-app purchases or ads, what I look for especially for use in storytime. For the rest of the time, we looked at and explored apps informally. Caregivers shared apps they have used and liked. Kids and caregivers had lots of questions about app suggestions, even for specific purposes like strengthening math skills, and how to select apps. Several of the adults also asked if we were going to offer a similar storytime again! I gave every caregiver a double sided information sheet, Kids and Digital Media Tips for Parents 10.13, which included app suggestions, developer suggestions, early literacy information, and resources for learning more. This kind of program offers a lot to think about, so something to take home was important. This was a successful pilot program that showed us two things. One is that a program like this one can be successful and is important to families. Secondly, it helped us assess the need for Saturday storytimes. We hope to host similar programs again as resource allows. This blog post content also appears at littleelit.com. Fall is on its way and kids are seeing moose cows and their calves everywhere here in Alaska. Storytimes about topics like the seasons and local animals are a must for helping kids relate to the stories they hear and understanding the world around them. This next feltboard story I told first with felt leaves (or bunches of spruce needles) and then using our fingers. Counting is an important toddler and preschool math skill which I include every week in some form another. It may be counting to three before we start a song or action or counting as we share a story like this one, for example. Four autumn leaves, that’s easy to see. Hang on, pretty autumn leaf! You’re one less leaf for me to rake! Now we had the opportunity to be leaves! 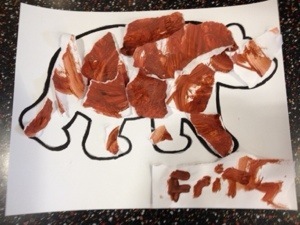 Kids at my library all know what moose look like, but before we read this story we talked about some of their characteristics so we could find them camouflaged in the story. I explained we were going to help the kids in the story spot the moose. We have some very good spotters! To reinforce the differences between moose and people, we followed the story with the hokey pokey, moose style. You take your right hoof out.